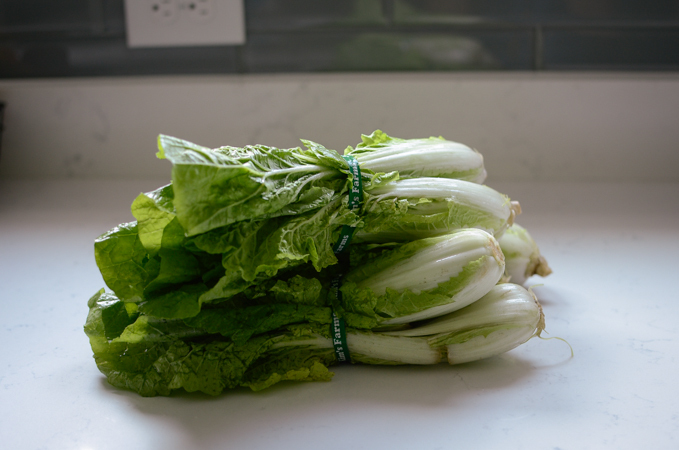 When it comes to a summer season, out of all kinds of leafy vegetables to make kimchi with, the young nappa cabbage comes its best to make summer style kimchi. 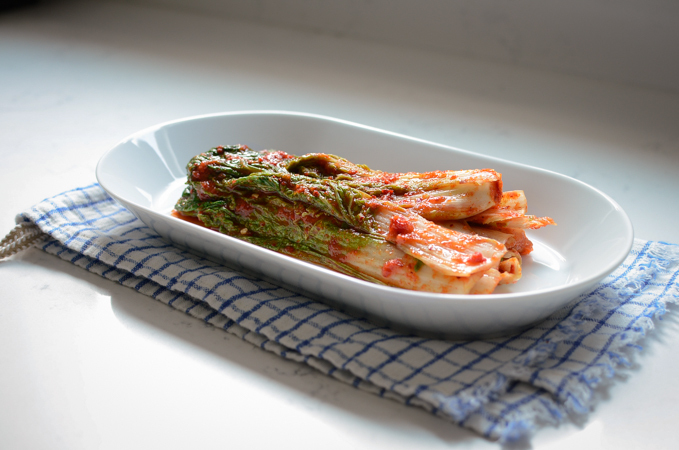 This summer cabbage kimchi has the tender crisp leaf and stem, just perfect texture for kimchi. 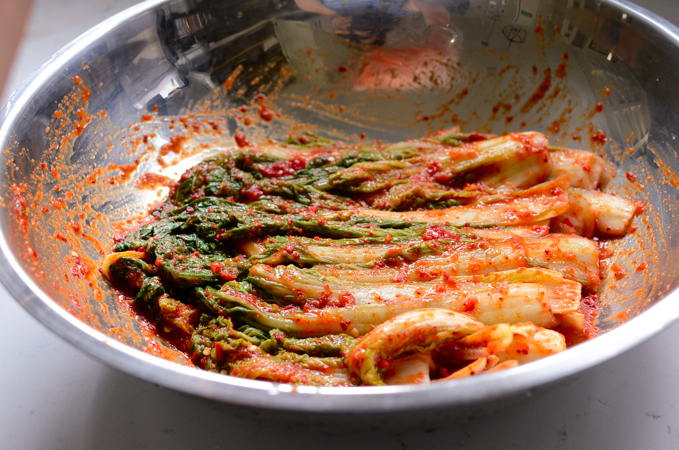 As I was growing up, I have seen my mother making summer cabbage kimchi from scratch every summer season. 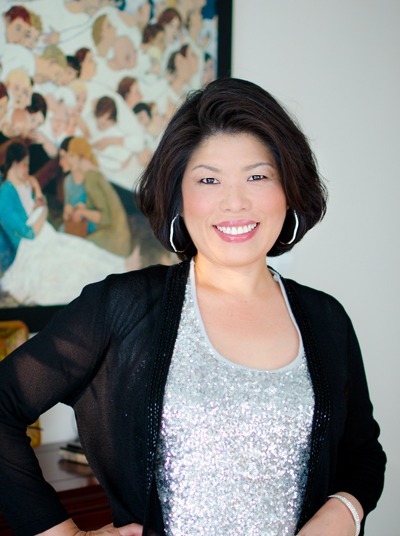 She used fresh red chili for the seasoning. It tastes good on the same day it was made as fresh kimchi, but it tasted even better after a few days. I remember how much I had enjoyed the flavor of the fresh chili in the kimchi. Adding a few fresh red chilies is a must for this recipe. It makes a big difference. These young nappa cabbages are sold in bundles like this. I used about 4 bunches. Sprinkle with some coarse sea salt layer by layer. Let them soak for 1 hour. Rinse 1-2 times and drain. Meanwhile I made rice glue with stock. I use seafood stock, but fruit stock or vegetable stock would work, too. Puree the onion, garlic, ginger, shrimp sauce first, the add the fresh chili just to pulse so that you will have some small chunks of chilies. 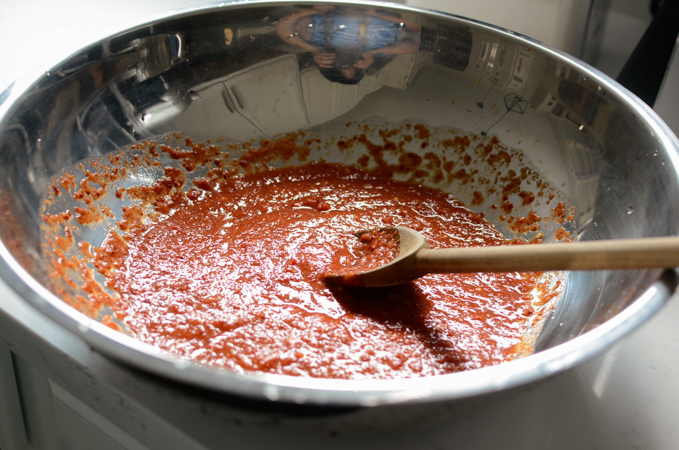 Mix the puree with red chili flakes and the glue to make kimchi seasoning. Sine it contains fresh chilies, it will be slightly loose. Gently coat the cabbage with the seasoning as much as you like. 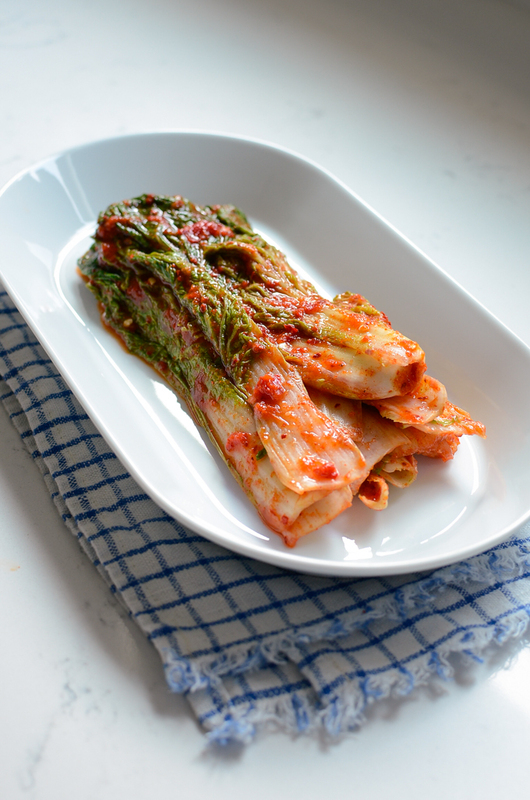 Try this summer cabbage kimchi on the same day you made to enjoy the fresh flavor. The leftover can be stored in an airtight container for 1-2 day on the room temperature for more fermented flavor. After that, you will need to store in the fridge fpr no more than a month. Summer cabbage kimchi doesn’t last that long. 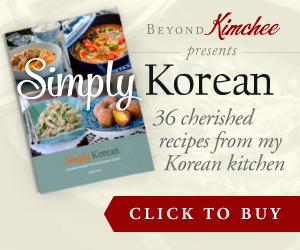 If you are a kimchi lover, try this recipe. You won’t be dissapointed. Separate the cabbage from the bunch and rinse. 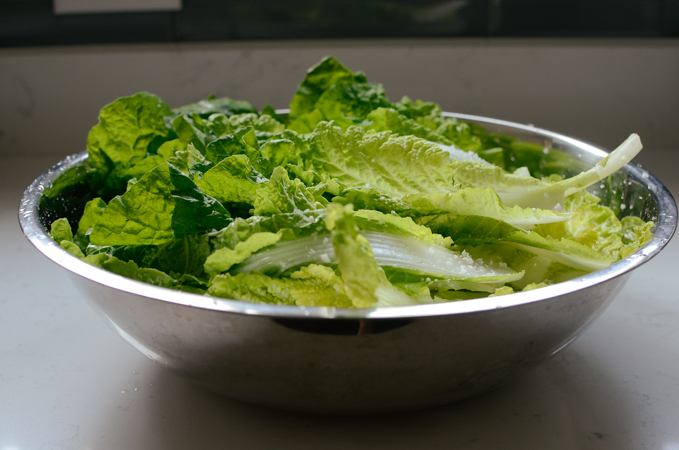 Spread a few leaves in a large shallow bowl and sprinkle with sea salt, about 1-2 table spoonful. Repeat the layer of the cabbage and salt. Let the cabbage soak for 1-2 hour until the they become wilted. Turn the cabbage upside down halfway through. Rinse the cabbage 2 times and drain in a colander. Set aside. 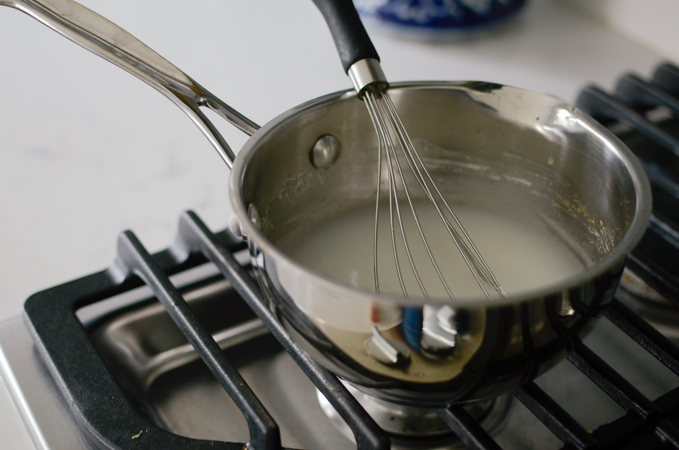 Meanwhile mix seafood stock with rice flour and let it thicken over mid-high heat constantly whisking. Set aside to cool. 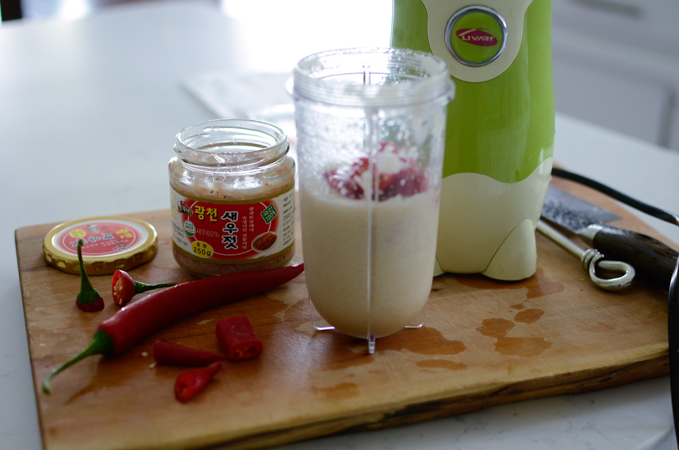 In a small blender, puree onion, garlic, ginger, shrimp sauce, and anchovy sauce until smooth. Add the fresh chilies and pulse a few times to cut into small pieces. Pour the chili onion puree into a mixing bowl, add the Korean chili flakes, and the rice glue. Mix well. The seasoning paste will be slightly loose. Spread the kimchi seasoning paste on to each cabbage so that it coats the entire cabbage evenly. Store the kimchi in an airtight container for 1-2 days on the room temperature, then transfer to the fridge for further fermentation. * Seafood stock : combine 5-6 large dried anchovies, 1 piece dried sea kelp in 1-1/2 cup water. Bring to boil and simmer for 5 minutes. Discard the seafood and reserve the stock. This looks like a nice and flavorful recipe, and pretty easy to put together. My kind! Thanks.